At Kho-Cha Darjeeling, we have been celebrating the very auspicious festival of Ganesh Chaturthi with lots of reverence and piety and a special puja being performed at the Kho-Cha shop premises at Ladenla Road. We have been celebrating this auspicious festival since the last 2 years, which was attended by a large number of families, customers as also well wishers from all over Darjeeling and tourists from all over India and abroad. 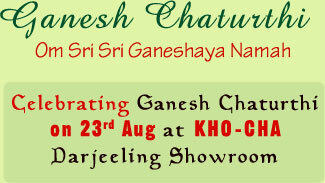 Please join us on the 23rd of August this year as we celebrate this auspicious occasion at our Kho-Cha store located at Ladenla Road, Darjeeling. Ganesh Chaturthi (Lord Ganesh’s Birthday) is celebrated on the fourth day of the bright half of Bhadrapad (August / September). 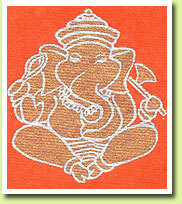 Chaturthi signifies that on this day Ganesh’s energy had reached the earth for the first time as he was born. It denotes Turyavastha – a state beyond Jagruti (The State of Waking), Svapna (Dream) and Sushupti (Deep Sleep). Though this is popularly believed to be Lord Ganesh’s birthday, it is also stated in mythology that this is the celebration of one of Lord Ganesh’s many incarnations-Mayureshwar. The rituals and worship during Ganesh Chaturthi helps mankind to get closer to Him. This festival gained importance during the rule of Chatrapati Shivaji Maharaj, the great ruler of the Maratha Empire (1627-1680). After him, the Peshwas took over the reigns under the guidance of Bajirao Peshwa (1721- 1740) and Lord Ganesh was their Ishta Devta (Family Deity). It is said that in 1815 when Bajirao II was in power that was the last time this festival was celebrated with great pomp. After the decline of the Peshwa rule (1818-1892) this celebration was restricted only to the families living in the state of Maharasthra. The Sarvajanik Puja (Worship made available to people from every walk of life) of Lord Ganesh was started in 1893 by Lokmanya Bal Gangadhar Tilak in Pune. He was keen to form a self government and put an end to the British rule. “Swaraj (Home Rule) Is My Birthright” was his slogan and a way of keeping up the spirit of freedom. His newspaper Kesari helped to kindle the flame of independence among the common man. Tilak used Ganesh Chaturthi to unite people from different caste and community, and encouraged them to join in to liberate the nation. The history of freedom struggle cannot be complete until one recalls Tilak’s immense contributions – as the father of the National Movement and an uplifter of the downtrodden. Namaami Nithyam Smaraami Nithyam , Deena Sharanya Paahi Prabhu.